 Former prison chief contends that secretary of defense and U.S. commander in Iraq approved coercive interrogation techniques. 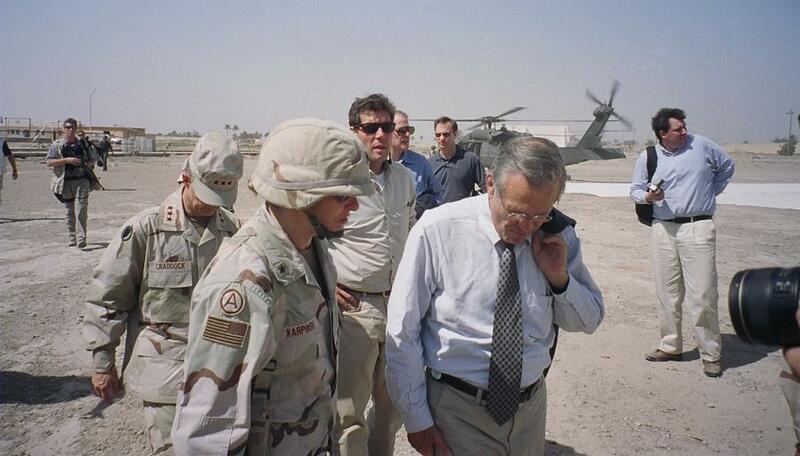 he former head of the U.S. prison system in Iraq told The Signal this week that Defense Secretary Donald Rumsfeld personally authorized the same types of coercive interrogation methods for detainees at Abu Ghraib that he approved for use on prisoners at Guantanamo Bay. The Pentagon denied the assertion Thursday. Brig. Gen. Janis Karpinski, head of detention operations during the period of Iraqi prisoner abuse, made the claim during an exclusive, two-hour "Newsmaker of the Week" interview that was conducted Tuesday. It will be shown Saturday at 5 p.m. on SCVTV Channel 20, with a written transcript in Sunday's Signal. Early last week the Pentagon released documents showing Rumsfeld approved the use of military dogs, stripping and sensory deprivation to cull intelligence information from detainees at Guantanamo Bay, where the White House had determined the Geneva conventions didn't strictly apply. Karpinski said there are memos showing Rumsfeld approved similar tactics for Abu Ghraib, where the Geneva conventions were supposed to apply. Signal: Are there documents showing Donald Rumsfeld also approved particular interrogation techniques for Abu Ghraib? Karpinski: I did not see it personally (at the time), but since all of this has come out, I have not only seen, but I've been asked about some of those documents, that he signed and agreed to. Karpinski: Yes. About using the same techniques that were successful in Guantanamo Bay, at Abu Ghraib. Signal: Those documents have not been released yet? 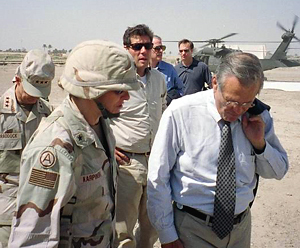 A Pentagon spokesman said Rumsfeld was never asked by the chain of command in Iraq to approve coercive interrogation techniques. "The secretary of defense was not involved in the process in Iraq or the Central Command theater," the spokesman said on the condition that his name not be used. "He wasn't asked to approve anything." At some undetermined date in the future, the Pentagon "will try to release the same kind of documents" for Abu Ghraib that it released for Guantanamo Bay. "The documentation may support who requested what kind of techniques," the spokesman said. Requests to use interrogation methods that aren't by the book would be initiated by the local commander and sent up through the chain of command, ultimately reaching Lt. Gen. Ricardo Sanchez, the head of U.S. forces in Iraq, and Gen. John Abizaid, head of U.S. Central Command in the Middle East. Karpinski said Sanchez, who was replaced Thursday as the commander in Iraq, cut the orders last fall to implement the special "interrogation rules of engagement" that were used at Abu Ghraib. The special rules called for Sanchez's personal approval whenever interrogators wanted to use dogs, strip prisoners, or deprive them of food or sleep. Sanchez has consistently denied approving or even knowing about the special rules at the time. Signal: What can you characterize about (documents authorizing special interrogation techniques)? Karpinski: I know that (Military Intelligence commander) Col. (Thomas M.) Pappas, on three occasions, sent a request to Gen. Sanchez to escalate their interrogations, and that involved using  and he lists them. And in one case he said they wanted to use dogs, and they wanted to increase the length of time that they could be isolated, food deprivation, that kind of  sleep deprivation. And in at least two of those cases, there is a signature of approval from Gen. Sanchez. Signal: And you've seen those documents? Asked to comment Thursday on Sanchez's involvement, Army spokeswoman Lt. Col. Pamela Hart said the Army is "waiting for the results of two investigations." Those investigations are an overall assessment by the Army Inspector General of detention operations at Abu Ghraib, and a formal Army inquiry into the military intelligence brigade that ran interrogations at the prison. "We are waiting for the outcome of those two reports before making any assessment," Hart said. On Jan. 19, six days after photographs of prisoner abuse were brought to his attention, Sanchez asked Central Command to approve an investigation of Karpinski's 800th Military Police Brigade. Central Command instructed Lt. Gen. David D. McKiernan to launch the investigation, and McKiernan appointed Maj. Gen. Antonio Taguba as the lead investigator. Karpinski, a one-star general, said she believes Sanchez, a three-star general, wanted to pin the ultimate responsibility for the prisoner abuse on her. She said she believes Sanchez instructed the two-star investigator, Taguba, to support his claim that the abuse stemmed from Karpinski's loss of control over her MPs. She said Taguba "went to see Gen. Sanchez, who said to him, words to the effect, 'I want Karpinski to be blamed, and I want you to go out and do an investigation to support that. She's a terrible leader because she allowed all these things to happen; now go out and do an investigation to support that conclusion.' That's what I believe." In his investigation report, Taguba wrote, "I totally concur with (Lt. Gen.) Sanchez' opinion regarding the performance of (Brig. Gen.) Karpinski and the 800th MP Brigade." Taguba reported that Sanchez "found that the performance of the 800th MP Brigade had not met the standards set by the Army" and that the prisoner abuse was "the most recent example of a poor leadership climate that 'permeates the brigade.'" It had been less than a year since the Army recommended, and the Senate approved, Karpinski's elevation to general. "I know how to lead," Karpinski said Tuesday. Per Taguba's recommendation, Karpinski was stripped of command of her 3,400-person brigade. She was replaced as the top jailer in Iraq by Maj. Gen. Geoffrey Miller, who previously headed detention operations at Guantanamo Bay. Karpinski said she was placed on temporary suspension. She has not been charged with a crime. An Army reservist, she is a business consultant living in South Carolina. Sanchez, who until recently was said to be up for a fourth star, is expected to be questioned in the military intelligence investigation. Asked Wednesday by NBC's Tom Brokaw whether he thinks he may be held responsible for the abuses shown in several widely published photographs, Sanchez said, "I'm very, very comfortable with the decisions that I made and the directives that were issued, and the judgment that I applied to the situations. And there was absolutely no command directive that would even give anybody the idea that that was acceptable in this command."